So, during the next August we will run away from the heat as much as possible... What does that mean? That our website will keep on working, you will be able to place orders and ask everything you need via chat or email, but shipments will only be made on certain days, grouping them in batches that will be sent during this month. We wanted to notify you in advance so that, if you realize that you need something urgently, you could take advantage of the last days of July, and so you take it into account for your orders next month. 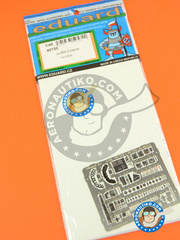 Full color printed photoetched parts for Hobby Boss Yakovlev Yak-38 interior. 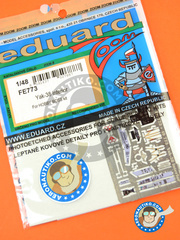 Pack of photoetched parts sheets for the interior, turbines, landing gear bays and other areas of Zvezda MiG-29. 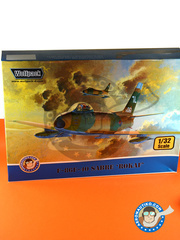 Pack including Kinetic scale model kit sprues, with additional decals for recreating 3 units operating at Korean AIr Forces, resin parts for the wheels, metal pitot tube, and a full color A3 sized instructions manual, all added by Wolfpack Design fellas. 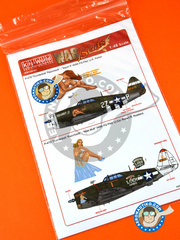 Decals for the Republic P-47 Thunderbolt D Razorback with registration 42-76275 'Squirt II' piloted by Lt R. Parker and for the unit with registration 42-8096 'Miss Mutt' piloted by Lt Col. Robert R. Rowland. 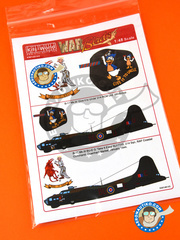 Decals set for decorating B-17 Mk.III with registration number BU-E KJ177/G 'Take It Easy' just like it flew on January 1944, or the unit known as 'Give it to Uncle', both at the 214th RAF Squadron. 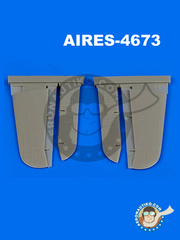 F/A-18A Hornet exhaust nozzles (closed position). 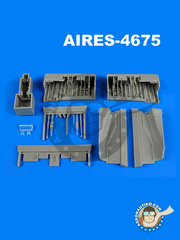 Fully functional resin made parts for replacing the plastic made control surfaces of the original kit, enhancing the realism of your scale model. 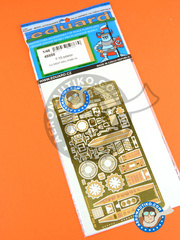 Set of two photoetched parts sheets for improving and detailing the interior of Hobby Boss Yak-38. 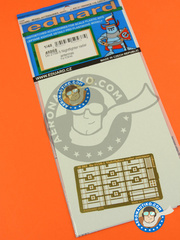 Full color printed photoetched parts for detailing the instruments and seat of the Nakajima E8N, as well as traditional photoetched parts for detailing the engine and other parts of the aircraft. 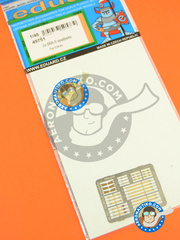 Set by Eduard of seatbelts in fully colored photoetched parts for detailing ICM Ju-88. 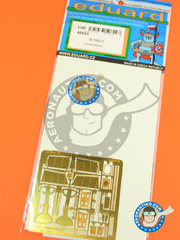 Set of two photoetched parts sheets for decorating the interior of the Ju-88. 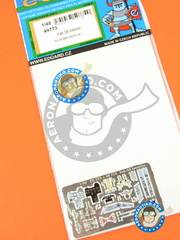 One of them also comes with all dials and avionics printed in full color. 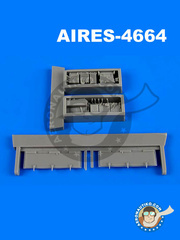 Photoetched parts for replacing wheel bay dors and other exterior parts of the Bf 109 G-5. 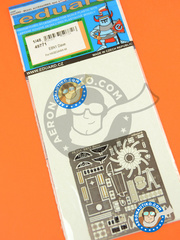 Photoetched parts for improving the exterior areas of the fantastic McDonnell Douglas F-15 Eagle by Great Wall Hobby. 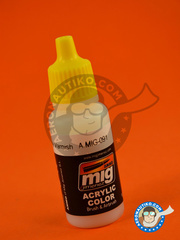 The antennas included in ICM scale model kit are made in plastic and way out of scale, so it's time to use these photoetched ones to accurately reproduce the iconic antennas of the Do 215. 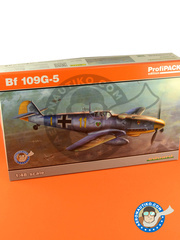 ProfiPack edition of the Bf 109 G-5, including colored photoetched parts, masks, and decals for 5 different decorations printed by Eduard. 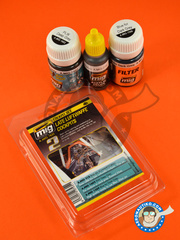 Set of resin parts for replacing the electronic equipment bays on Revell kit. 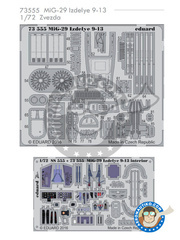 Enhancement set for the electronic and weapons bays of the F-104G/S Starfighter, including resin made and photoetched parts. 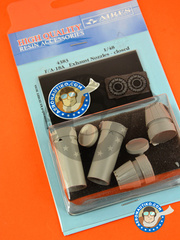 Set of wonderful resin parts for replacing landing gear bays and doors on 1/48 scale Revell Tornado. 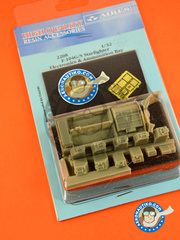 Pack featuring the 4 colors used by the US Navy during World War II. 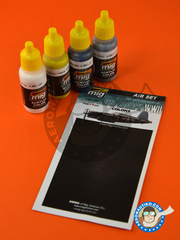 Set of basic color for painting the cabins on the late World War II German Luftwaffe planes based in the RLM 66 Schwartzgrau, such as the Fw 190, the Ju 88 or the Me 109. 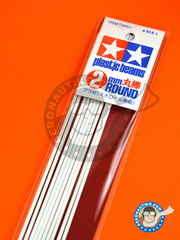 Round plastic beams measuring 2mm diameter and 40cm long, perfect for scratch building your own parts. 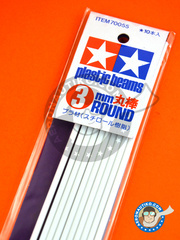 Round plastic beams measuring 3mm diameter and 40cm long, perfect for scratch building your own parts. 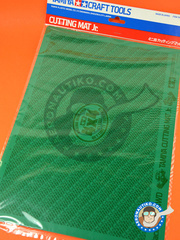 Auto repairing A4 size cutting mat.